Be careful out there, people. There’s dangerous elements lurking about in our fair city. 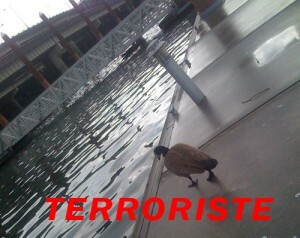 This entry was posted in blogging, Portland and tagged portland wildlife, terrorism by Morgan. Bookmark the permalink. I hope he stays away from my damn plane on Friday morning! I plan on going to Connecticut and by gum I mean to go! Oh noes! I’ll be sure to set up some clandestine tracking devices to ensure they stay far away from PDX. Have a safe trip!